Mike Saunders and Graham Morrison popped by the FSFE head office in Berlin to see how the organisation is spreading the word about FOSS. You’ve almost certainly heard of the Free Software Foundation before. This is a US-based non-profit organisation set up by Richard Stallman, the creator of GNU, in 1985. Originally it was established to fund programmers, but over the years it has moved into other realms, handling legal issues and promoting Free Software. Since 2001, a European spin-off has existed: the Free Software Foundation Europe (FSFE – www.fsfe.org). It’s a sister organisation of the FSF, but also a financially and legally separate entity. 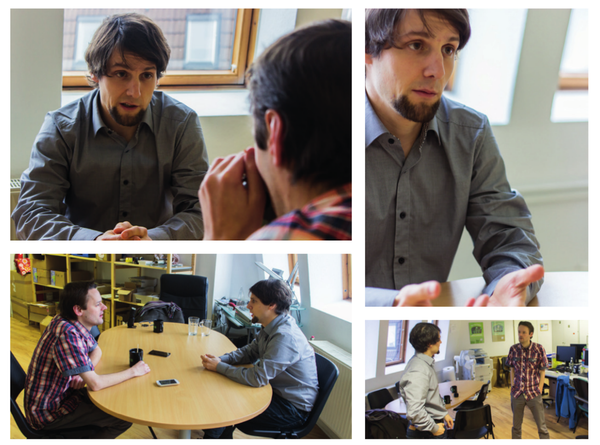 On a recent trip to Berlin, we poked our heads into the FSFE office to see how they work on a daily basis. Dealing with politicians is tough, though, especially when they’re not technically inclined. Matthias described how in the early 2000s, when he approached politicians to talk about Free Software and related issues, he felt he was often dismissed. “They would think: who are these freaks, talking about source code and digital rights and stuff?” But as time went on, as more and more people started approaching their local politicians and MEPs about these issues, they had to take it more seriously – or at least, ask their staff to find out what it’s all about. When Citizenfour (a film covering the NSA spying scandal) hit the cinemas in Berlin, FSFE supporters stood in front of the cinemas, handing out leaflets explaining the importance of email encryption and how to use GnuPG. In one cinema in the UK, these leaflets were also handed out when people bought tickets, so this targeting is becoming increasingly important to the FSFE. For the 2014 European elections, the FSFE created the “Free Software Pact” a document that candidates for the European Parliament could sign saying that they favour Free Software and will protect it from potentially harmful legislation (www.freesoftwarepact.eu). 162 candidates signed up, and 33 were elected. But what would happen if Stallman were to step down? Matthias doesn’t think this is likely any time soon – he may go slower as the years roll on, but his passion and enthusiasm are as strong as ever. But Matthias also noted that Free Software has become much bigger than just a single personality, and the principles are what really drives the movement now. At the end of our visit, we asked Matthias if he was happy with what the Free Software Foundations have achieved so far. He noted that a lot has been done, but it’s a long-term battle, comparing it to freedom of the press. That didn’t come in overnight, but was a long process and has to be maintained and fought for. Free Software is doing well, but to get it into more government, schools and other public institutions, a long slog is required.